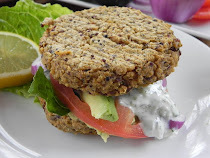 This yummy little recipe was born several years ago when I had to bring something to a school pitch-in and was either too tired or out of time to make a run to the grocery store. I am a firm believer that oil & vinegar makes everything taste great. Back then, I threw a mixture of salad dressing and spices over drained & rinsed cans of corn, chopped tomatoes, and kidney beans. Everyone raved about it and asked for the recipe! It eventually morphed into the salsa posted here, but any kind of beans could be used: black, pinto, kidney, etc. Likewise, you could throw in cilantro, red onions, even avocado - the possibilities and variations are endless. 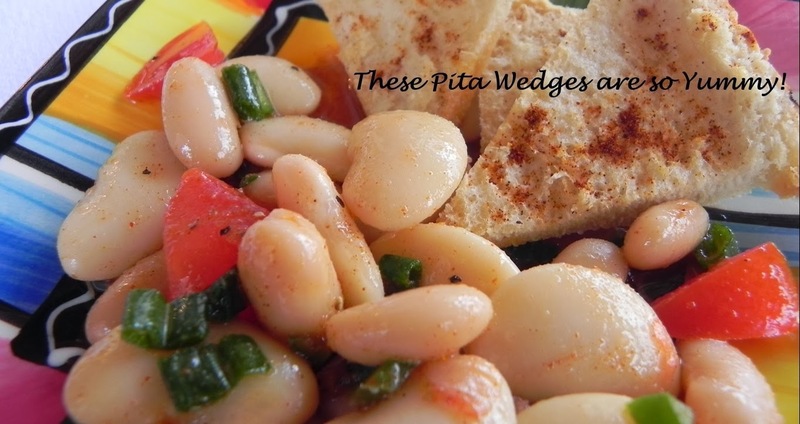 I love the mixture here with these toasted pita wedges. You could be healthy and use whole wheat ones, but I enjoy the white flour pitas because they pair so well with the taste of tomatoes. This is also wonderful in a salad. Preheat oven to 350. Cut each pita "loaf" in half and separate the top of the pockets from the bottoms by cutting through the edges that hold them together. Then cut the pieces into triangle shaped wedges. Each separated half will yield four wedges. Cover two baking sheets with foil and spray them with cooking spray. Distribute the wedges between the two baking sheets so there is a single layer of pita pieces on each sheet. Spray the wedges with cooking spray and sprinkle the 1 tablespoon of chili powder over the wedges on both baking sheets. Place the baking sheets in the oven and bake for 10 minutes. While the wedges are baking, prepare the salsa. Using a colander, drain and rinse any two cans of white beans. 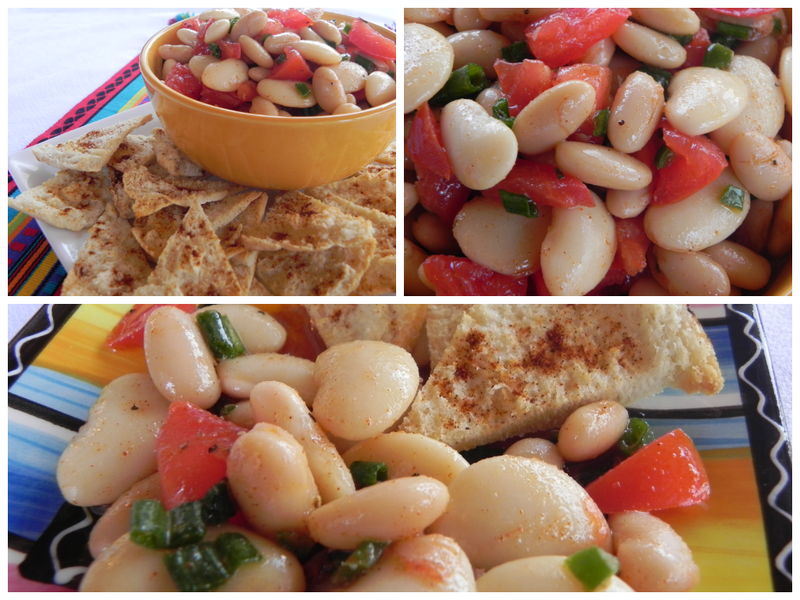 I love to use butter beans and Great Northern beans. Chop up the tomato and slice enough of the green onion to make 2 tablespoon full. Discard the seeds and membrane of the jalapeno pepper; then finely dice the pepper. Place all in a mixing bowl and set aside. In another mixing bowl, combine the olive oil, vinegar, chili powder, cumin, salt, pepper, and garlic powder. Whisk it well so that the dressing is well combined. Pour the dressing over the vegetables and then gently stir to combine all the ingredients and coat with dressing. Put the mixture into a serving bowl and serve with the toasted pita wedges.